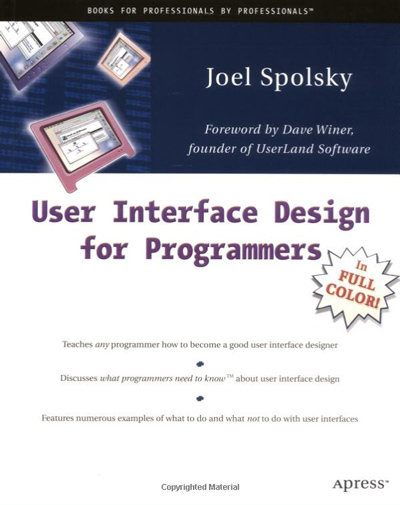 philosophy : Thoughts on Joel Spolsky's "User Interface Design for Programmers"
Thoughts on Joel Spolsky's "User Interface Design for Programmers"
I'm afraid that I empathize with some of the less positive reviews on Amazon. When people buy texts on user interface instead of reading "some guy's blog," it's usually because they are looking for well-vetted and researched ideas they can apply. But anyone experienced enough to properly take action based on this book's glib advice (like "users don't read!") is probably smart enough to make all the necessary realizations on their own. If you're designing emergency exits on airplane, you need to make sure that someone can get the door open without a tutorial. The flight staff is required by law to explain how to work it, but it still needs to be obvious. A person looking at a picture of the exit must be able to accurately answer how it would work without even touching it. Yet most software doesn't have this life-or-death aspect. So it's acceptable to break a couple of initial expectations or stereotypes that were learned in other programs...if your software's new method has a productivity payoff for the relevant task. The book describes this an interface which is "learnable"--as opposed to one that is immediately "usable". Using Joel's terminology, I'll say that I've always felt it far more important that software be "learnable". It's sad to me when organizations throw a lot of time into compromising a program's power and beauty...merely to force it to make a mundanely comprehensible first-impression. Much more exciting is when they devote those resources toward exploring clever ways for the program to reveal its novel functionality. Though I think LittleBigPlanet does this unusually well, practically every video game these days weaves its own tutorial into the gameplay. This is true even though the buttons and game mechanics are radically different! Consumers now expect to be able to learn the game by playing, so game discs aren't really shipping with printed manuals any more. I think application software is getting ready for a similar renaissance. Screencasting is an easy agent of change--we can now record and narrate a feature in action, and point users around the world to a URL to see it. Media interwoven in smarter applications will hopefully free the hands of software developers from thinking their programs all have to look and feel like Microsoft Excel, and they can focus on the internal consistencies that make their work learnable. 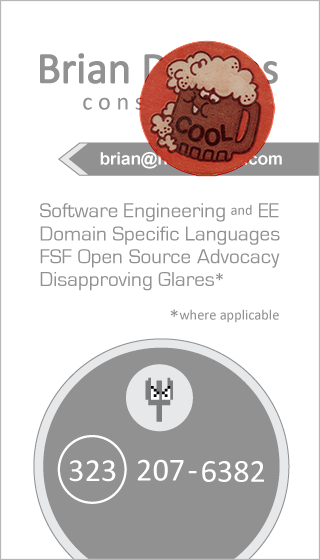 Programming enthusiasts often complain that it's limiting to use physical metaphors for software objects. When we train people to model their computer in these mundane ways, they tend to underestimate the real flexibility of the digital medium. Editing a sheet of "paper" on screen may be easy to understand, but it says nothing of the vast difference in capabilities between a digital document and typing paper. So why start people off with something that's cut into 8.5" x 11" sheets?! Joel mentioned a case I hadn't thought much about, but is clever (or ironic, depending on how you look at it). The "trash can" feature in the Mac OS was added so that as long as you had extra hard drive space, you didn't delete a file immediately...you got to keep it around in case the deletion was an accident and you needed it back. Yet they made a choice to physically draw a non-empty trash can as looking as if it were heaped with garbage. Regardless of whether they need the disk space back or not, many people compulsively empty the trash each time they delete a file. It just bothers them to have "trash" around--as if it would start to smell if they left it too long! Users of this type are getting no advantage by having a trash can instead of instant deletions--their deleted files are gone for ever. Plus they now have some additional work of clicks to empty...instead of just one drag and drop! When this was mentioned in the book, I realized how I'm certainly influenced by this. I empty the trash because I'm troubled by it being there. Continuing this line of thinking, it made me think about other ways of controlling behavior by using "dirt" and "ugliness" for leverage. If a designer can't stop a user from doing something, then perhaps at least that thing can be made to feel less pretty than doing it right. In one program I was writing, I used this principle. It was a system like Wikipedia, where a word like "Africa" might resolve to the continent or the rock song by Toto. An unresolved ASCII string was better than nothing--yet I wanted to give a strong visual encouragement to actually invest the work of linking it. I actually considered some other ways of making it ugly, perhaps even making the font and background look like it had been scanned--with some pixelation noise! Anything to hint that something "dirty" was going on. I'd really like to find some more examples of cases like this, where software subtly shows dirtiness through visual feedback that gets them to compulsively "clean up". Can You Crack "Arecibo ASCII"?